Large metering bin is loaded with mixed recyclables at the start of the single-stream system. Pre-sort line. Materials too large for the downstream system to process are removed by hand prior to entering the OCC separation screens. The first OCC separation screen. All bulky cardboard is removed from the mix at this location and sent to a baler. View of maintenance platforms, which provide access to the equipment. 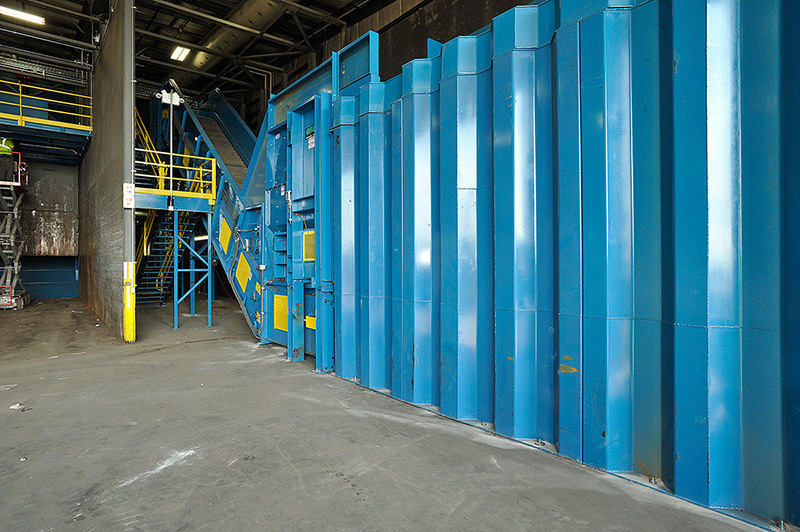 A second set of polishing screens continue separating fibers from plastic bottles, tin and aluminum cans, and aseptic containers (paper cartons). Final polishing screens remove any remaining fiber and send it to the fiber sort line. View of fiber sort line. Recycling staff will sort separated materials into the proper bins at this location. Bin where all sorted containers are stored prior to processing through the optical sorters. One of four Green Eye optical container sorters used to separate plastic bottles by type; also pictured is the bag vacuum system blower unit. Green Eye high intensity lighting system. Floods the accelerator belt with light enabling vision system to collect the data it needs to fire air jets and remove desired recyclable products. Green Eye Optical Sorting Systems high speed accelerator belt. Travels at 500 feet per minute and evenly disperses material load so that optical sensors can identify isolated containers for sorting.